disconnected... and it feels so good! 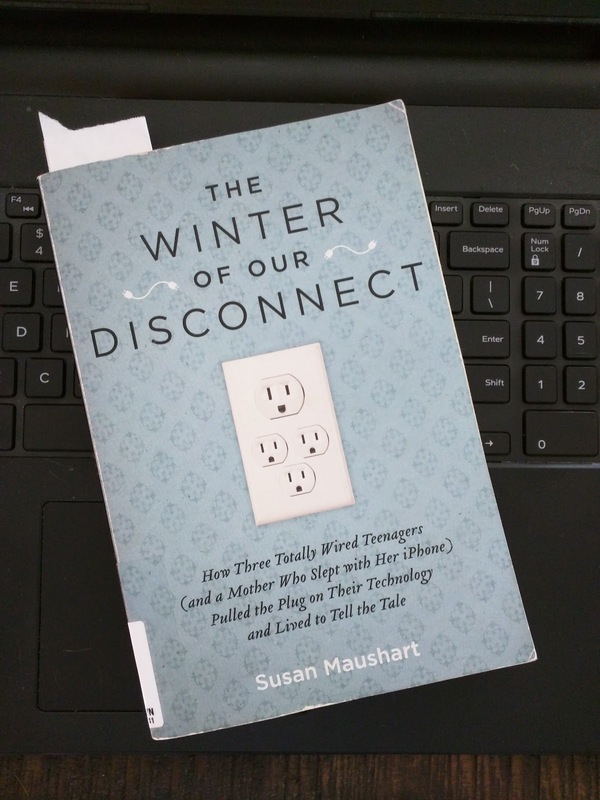 The Winter of Our Disconnect (Susan Maushart) was published in 2010 so the statistics included are out of date now, but still, eye-opening at times. I haven't checked specifics, but I'd guess current stats would show average screen time has increased immensely. Agree or disagree with her method of this disconnect (her no screens rule applied only at home so access was still available everywhere else - one child even moved out during part of this experiment to stay constantly connected), this experiment certainly impacted their lives, especially those of her teenagers. I do find it disturbing just how connected kids (and most adults) are these days. It is a different world now and technology isn't going anywhere, but I do agree that boundaries are good and time away from digital devices is beneficial for everyone. I love that her son redirected his new disconnected time into music. And it seemed all of them benefited in improved schoolwork. Sleeping patterns changed (for the better). They became closer as a family as they talked more rather than retreating to their various devices. So many good things occurred because of the digital limitations. I was shocked at the fervor with which they dove back into connectivity though. I was hoping they'd go back a bit more slowly, having learned they didn't need to be constantly connected. 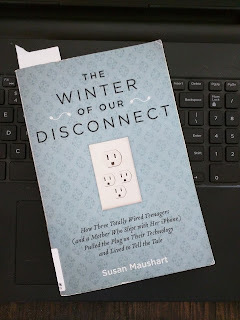 Like the author, my job requires computer use (I work remotely from home) so a complete digital fast isn't possible without taking time off, but I do try to limit my exposure. Back when I was working insane hours, I took my one day off each week as a Tech-no day. I shut my router off Saturday night and kept my cell phone in one spot so I could still answer calls, but wouldn't be tempted by texts or apps and nothing came back on until Monday morning when I sat down to work again. That weekly break was so refreshing! Since I wised up and changed jobs last year, I now very happily work only a 4-day week. This left me less stressed and I didn't feel as great a need for that complete break so I've fallen a little out of the habit of taking a full day away from the internet. Some weeks I still do it, but not always. Long ago, I turned off the notifications on my phone and tablet and I quit using Facebook when I realized I just didn't enjoy it that much anymore (no, I don't miss it and it's been probably a year or more). This means I'm only on social media when I choose to be (rather than in response to continual pings). I still enjoy Instagram and Ravelry for most things crafty, but I keep the groups and people I follow on the lower side. I use feedly to keep up with some blogs I enjoy too. Am I missing stuff? Sure! But I somehow survive. A little distance can be good. I think I'll reinstate my Tech-no Sundays again and throw in an occasional 3-day break here and there.